A higher female labour force participation rate would increase consumption and therefore production. As India primes for elections, a key challenge facing India’s economy is the job crisis. Between 2011 and 2015, the unemployment rate in India rose from 3% to 5%, and is estimated to have further increased to 7% by the end of 2018. Making matters worse, only 4.3 million jobs have been created per year since 2012, even though 12 million people enter the workforce every year. While the dire condition of employment in India has only recently gained attention in the national discourse, the problem had existed for at least two decades. The only difference is of the gender of the unemployed. As opposed to 79% men, only 27% of Indian women were a part of the workforce in 2017. 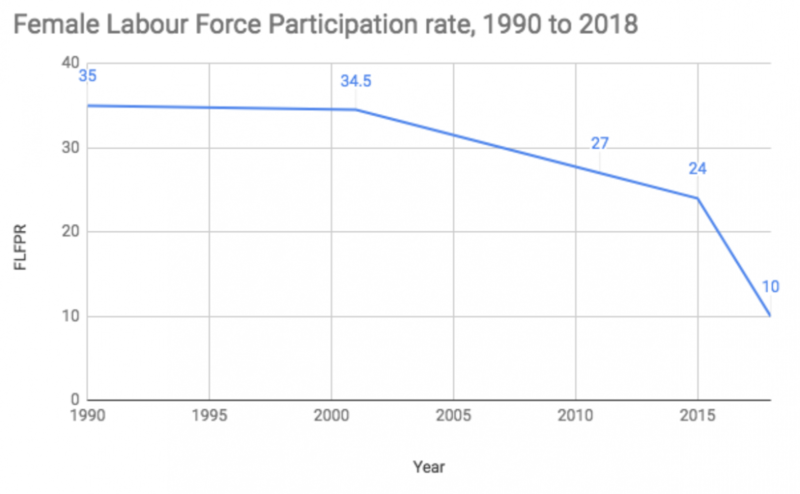 The female labour force participation rate (FLFPR) in India declined from 34.8% to 27% in the two decades before 2013, according to a World Bank report. As per the calculations done by the Centre for Monitoring Indian Economy, one of the leading business and economic database, the FLFPR further declined to 10% for the period of May to August in 2018. Meanwhile, as per a McKinsey report, men have been employed in 90% of the 36 million additional jobs created in India since 2015. Lack of agency – women do not have the freedom or support to make decisions regarding their education or career. This limits their ability to pursue independent choices and cater to the demands of their jobs. Often, the lack of agency results in them quitting the workforce or opting for positions below their qualifications. Occupation segregation – Owing to the limitations set by their families and society in general, women are educated and skilled in certain specific sectors like the beauty industry, teaching etc. As a result, while women dominate these sectors, it further excludes them other opportunities. The increased competition to work in these limited sectors also lead to reduction in wages, and limited career growth. Socio-economic status of the women – The economic and social background plays an essential role in defining the education and job prospects available to women. In most situations, women from low economic backgrounds have limited access to education and training but are allowed to work to add to the household income. However, women from affluent families are allowed to pursue education at their will but do not have a similar freedom with respect to pursuing a career. Keeping in mind the complexities leading to the drop in FLFPR and the decline in the job creation, the obvious question is why do we need women in the workforce? In July last year, The Economist did a cover story on how India is losing 235 million employees because of the gap between the male and female labour force participation rates. Also read: Javadekar Says India’s Job Numbers Are Low as Women Don’t Want to Work. True or False? by creating additional jobs in the household economy. India is a consumer-based economy – its growth is largely driven by the consumption of goods and services within the economy. A rise in consumption stimulates demand for the goods and services leading to a hike in their supply and the creation of new jobs. With more women earning, there would be an increase in the spending capabilities at both the individual and the household level. This would expand the supply of goods and services creating an impetus for more jobs. In order to encourage more women to join the workforce, we need to create policy changes that incentivise their participation. Promoting pay parity and creating a safe environment at the workspace are basic steps that need to be taken in order to increase the FLFPR. Another advantage of having more women in the workforce is that it helps create jobs in the household economy. One of the most common arguments against letting women work is that it would hamper the household economy predominately managed by them. Right from cooking and cleaning to stocking food and managing assets at home, women oversee varied tasks to maintain a functioning household, often referred as unpaid housework. Based on the calculation by the United Kingdom’s Office for National Statistics, unpaid household work and childcare was worth 1 trillion pounds ($1,289 billion) in 2016. However, instead of creating market value for such jobs by outsourcing them, these tasks are managed primarily by women across economic groups in the country. A large number of women stepping out of their houses would increase household income and create opportunities for jobs in household care like cleaning, cooking etc. Along with increasing the number of women in the workforce, it would also provide scope to market unpaid housework and allow the economy to capture the value generated by these activities. With the estimated 11 million job losses in 2018, it is evident that we need policies that would provide a substantial stimulus for growth. Instead of ignoring the shrinking FLFPR, we can be working on solving the problem so as to save the rest of the economy. Devika Kher is a policy analyst at the Takshashila Institution. Her research focus includes public economics, urban governance and labour economics.